HealthAid Cysticare tablets are specially formulated using natural and top quality herbal extracts that are refined and purified for maximum absorption and utilisation by the body. The goodness of Cranberries is blended with other herbal ingredients to make Health-Aid Cysticare the perfect supplement for women to help maintain a healthy urinary system. Cranberries Extract- cranberry provides the urinary tract with high acidity to create a hostile environment for the E coli bacteria, which are responsible for causing bladder problems. By consuming cranberry, you can kill the E coli bacteria and eliminate the painful symptoms caused by urinary infections. What are Cysticare tablets for? 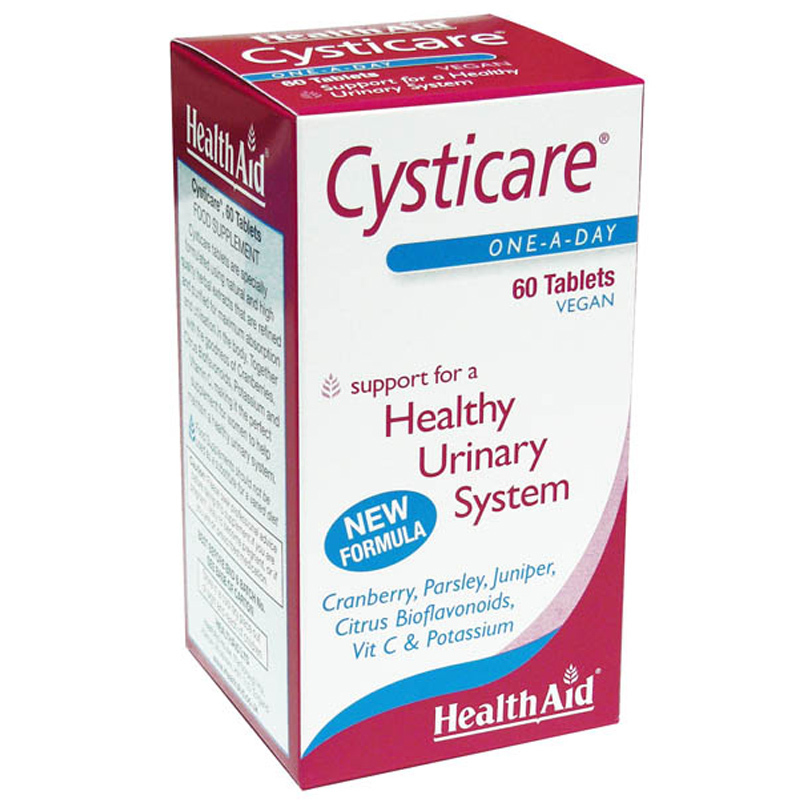 Cysticare tablets may help eliminate or reduce symptoms related to urinary tract disorders or infections, such as; A strong persistent urge to urinate. 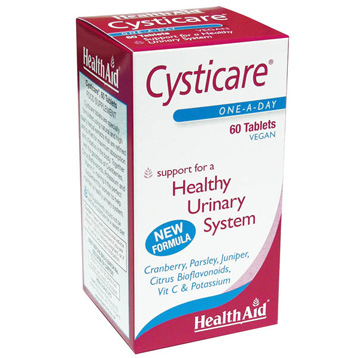 Cysticare tablets are ideal to be taken during times of urinary discomfort or as to ensure general urinary health. Each tablet contains ( average ):- % RDA Vitamin C 125.0 mg 208 Cranberry Fruit ext. ( 25:1 ) 250.0 mg * ( equivalent to 5000mg of pure Cranberry powder ) Dandelion Root powder 50.0 mg * Parsley powder 50.0 mg * Sage 50.0 mg * Uva Ursi ext. ( 4:1 ) 50.0 mg * Stinging Nettle ext. ( 4:1 ) 25.0 mg * Buchu Leaf ext. ( 4:1 ) 25.0 mg * RDA: EC Recommended Daily Allowance * : EC RDA not yet established. Free from artificial flavouring and preservatives. No added Sugar, Salt or Starch. Suitable for vegetarians. Free from yeast, gluten, soya & wheat. Adults and children over 12 years of age, two tablets daily. Can be increased to four if required. Store in a cool, dry place, out of sight and reach of children.